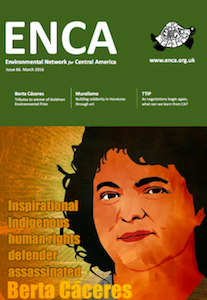 The killing of Berta Cáceres shocked the world earlier this month, and in this edition of the ENCA newsletter we dedicate a number of articles to her life, her work, and the structural policies that have led to her murder. We also have articles on Lenca protest art, with a chance to buy a unique painting by Lenca artist Javier Espinal. which will fund resistance in Honduras. And Doug Specht gives us a glimpse of a future under the TTIP agreement.